There are two main theoretical frameworks defining mindfulness. The first of these, developed by Jon Kabat-Zinn, relies on paying attention to the present moment, non-judgmentally and therefore free of emotional and moral assessment. Meditation is an important tool for mindfulness in this approach.1 In contrast, Ellen Langer’s concept of mindfulness does not rely on nor promote meditation. Rather to be mindful is to actively notice novelty and the full context of a situation, guarding against repetitive thought patterns and habitual categorizations from the past (e.g., How does my spouse’s face look different across the breakfast table this morning as compared with yesterday morning?). I find that more often when we talk about mindfulness, we implicitly refer to Kabat-Zinn’s concept, equating mindfulness with meditation. 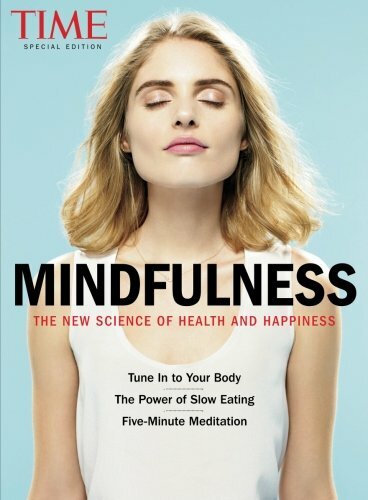 This summer, TIME Magazine issued a Special Edition: Mindfulness: The New Science of Health and Happiness. In an article titled Can You Shed Pounds on a Mindfulness Diet?, Kathleen Mulpeter describes research investigating the effects of mindfulness on health outcomes and weight status. In one study, participants asked to answer a set of mindful questions while eating fared better at maintaining weight loss than those who practiced self-compassion meditation.2 These mindful questions included “How does this meal taste?” but also “How kind are you to yourself now that you ate this meal?” While participants in this group were instructed to record their answers in a food diary, benefits extended to those who chose not to write anything but simply kept the diary open while they ate. In short, the journal’s sheer presence was a reminder to approach the meal with a little more thoughtfulness, and a little more kindness. 2 Mantzios, M., & Wilson, J. C. (2014). Making concrete construals mindful: A novel approach for developing mindfulness and self-compassion for assisting weight loss. Psychol Health, 29(4), 422-41. Here, among other things, I will provide commentary on some of the fascinating books and articles in the fields of nutrition, food psychology, eating disorders, and body image.